Whether spring break, spring cleaning or springing forward here's a list of the top slogans for 2019. As the snow melts and new life begins to bloom, Spring marks the beginning of the vibrancy of the year. From cool breezes and the buzzing of the bees to sunshine and rain puddles, spring is definitely a favorite season among many. Here are some fun Spring facts to get you excited for the months ahead! The first day of spring is called the vernal equinox. The term vernal is Latin for "spring" and equinox is Latin for "equal night." The first spring flowers are typically lilacs, irises, lilies, tulips, daffodils, and dandelions. Spring is the best time of the year. With all that rain and sunshine comes new life. Finally after a long winter, nothing feels better than shedding your winter coat and watching the snow melt away. Small flowers start to pop up and color the still brown surfaces in yellow, blue, white pink, and lilac; the first buds appear on the trees; birds start to sing early in the morning; the daylight is back and the sun up at 6 am; air temperatures are slowly creeping upwards; winter clothes are gradually disappearing and people are enjoying drinks in all the outside restaurants. It's the perfect temperature to go outside for a picnic, play some football, or just go for a brisk walk without breaking too much of a sweat. 1 Keep calm, spring has begun! 4 Spring is in the air! 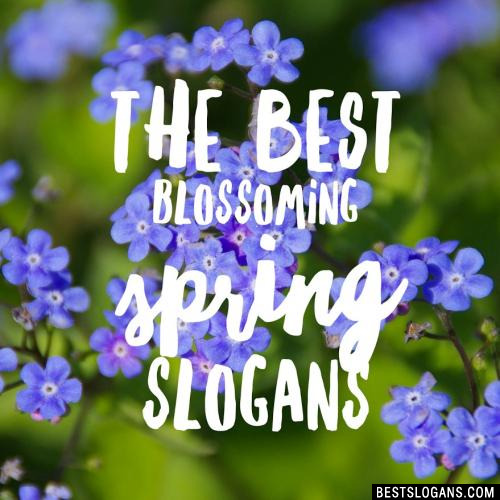 Can you think of a good Spring Slogans we're missing? Or come up with a clever one of your own. Please share below.